Hello readers! 2018 was a super busy year at Source One and Corcentric, and it shows no signs of slowing down in 2019. The combined offering of source-to-contract (Source One) and procure-to-payment solutions (Corcentric) that we’ve developed through Corcentric’s acquisition of Source One has received such a positive market reception that we’ve been moving full steam ahead since day one. I underestimated how much demand Procurement professionals and Finance professionals would have for a true source-to-pay solution; but its been a wonderful challenge and adventure developing and implementing these bundled spend management solutions. This isn’t just a self-promotional intro, it has relevance to this post, as I’ll demonstrate in a second. The busyness of business this past year has made it difficult for me to find the time for one of my favorite (work-related) pastimes, ranting. it’s been a while since I was last able to ramble on about my procurement pet peeve of the month. But no worries, I am here to day to remedy that. Here’s the tie-in to the source-to-payment plug in my first paragraph. Tail Spend Management has rapidly become one of the most talked about hot buttons in procurement this year. And as expected, with it came a bunch of companies claiming they could manage your tail spend for you. But most of those companies aren’t offering anything new, and aren’t actually managing anything. I’m here to call them out. We’ve seen two types of providers start to re-brand their services to be “tail spend management”. The first is the traditional procurement BPO companies. The second is the tech providers. 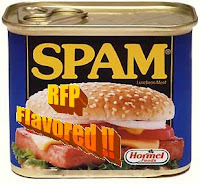 Every couple of years, I go on a new rant about what I call “RFP Spam” . This year, it seems that many software (SaaS, cloud, insert other buzzword here) have embraced the entire 3-Bid-&-Buy RFP Spam mentality and packaged it together in something they call “Automated Tail Spend Management”. These tech providers are selling nothing new, they are simply repacking old products that have been around for the better part of 2 decades. What’s worse is (a sign of a new tech bubble?) many of these companies have big venture capital dollars behind them because they’ve somehow convinced equity providers that they’ve invented something new. I’m not going to name names, but it is easy to find who I am talking about. Some of these companies have already raised tens of millions of capital, with only a tiny fraction of that number in revenue. They’ve done so by taking e-sourcing technologies that have been around for a long time, and branding them and positioning them as the solution to Tail Spend Management. Sure, some of them have slick interfaces, and are pretty easy to use; but running an RFP, or more properly, an RFQ is not true spend management. Let’s see how some of the most popular “automated tail spend management solutions” work. In many of these organizations, they provide a hybrid software/service that is really just a slightly automated RFQ process. You kick a specification over to them, they (or you) set it up in their tool, invite a bunch of vendors, get some bids and choose one of the least expensive ones. They then “prove savings” by taking the average price of the three bids subtract out the lowest bid, and show that to you as savings. In other examples, the tool providers just provide the e-sourcing suite (or plug-in) itself and you do all the work, again, looking for an RFQ or even Reverse Auction result of a lower price. Nothing new or innovative here. Effective? Sure, it can give you some minor savings; but it definitely doesn’t deserve to be called tail spend management. In fact, in some cases, the process itself might have been more expensive than if you had just allowed a spot-buy. • Comparative benchmarking pricing analysis that reviews categories/purchases from sources outside your own 3 bid RFQ process. So, rest assured, I’ll be back on this topic again; and will be providing a lot more detail. Until that time, don’t be fooled by a simple e-sourcing suite that’s been re-branded to be called Tail Spend Management. In the meanwhile, we’d be happy to discuss with you a solution that can be much more effective at reducing your tail spend. Ready for ExecIn at ISM2019? Is Your Job Like a Horror Movie? How Do Drones Help the Planet?